Josh Biren and Tess McKenna measure the world record setting apple fritter: 24 inches by 24.5 inches, with a 31-inch diagonal. 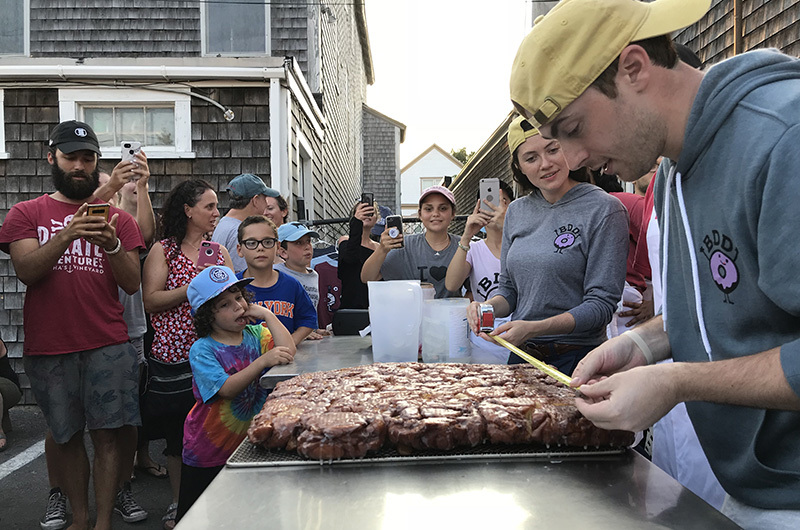 According to Josh Biren, general manager of Back Door Donuts, to break the Guinness Book of World Records for the largest apple fritter two things needed to happen. “It needs to be big enough and at least one piece needs to be edible,” he said on Sunday evening as two lines formed at Back Door Donuts. One group, more of an amoeba shape than a line, was there to see, cheer and taste the largest apple fritter ever made. The other group appeared to have no clue something extra momentous was happening — for them an evening at Back Door Donuts was already a celebration. The event turned out to be more setting a record than breaking one. Evidently, previously large fritters didn’t include real apple slices so did not measure up, with or without a tape measure. Huh? The crowd pointed to the sign that read Back Door Donuts, and the chant was re-started, this time using the approved spelling for donut. 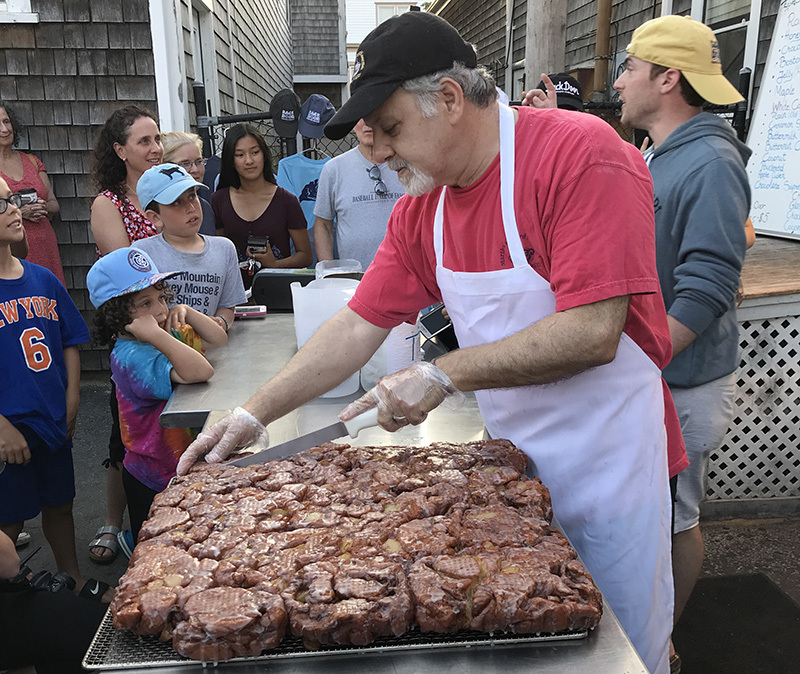 The bakery had solicited videos asking “What Would You Do With the World’s Largest Apple Fritter?” The winning video maker would be the first to taste the fritter when it came out of the fryer. The honors went to Camp Jabberwocky who came out in force to taste the fruits of their victory. The video included a series of answers starring a human sized fritter: make a boat (which was then eaten by a shark); marry it (the fritter was the groom); have it join a mariachi band (it wore a large sombrero); or just eat it, which the campers did (to the tune of Eat It by Weird Al Yankovic). When the big moment arrived a cheer rippled throughout the parking lot. Mr. Jabri raised the humongous fritter high while someone called out the official weight: 15 pounds, 11 ounces. Then the fritter was placed on a table and put to the measurement test: 24 inches by 24. 5 inches, with a 31-inch diagonal. A record was set, (unofficially as Guinness still needs to make the final decision), and the baseline was created for which all other giant apple fritters will be judged. And then the eating began. Camp Jabberwocky led the way and afterward Mr. Jabri began slicing and slicing and slicing and slicing, until the world’s largest apple fritter disappeared in a matter of minutes, each bite not just edible, but delicious. This is a must stop for my family's summer visit. I hardly ever eat donuts in nyc but these I cannot resist. Love It! Great story!!!! To bad Doug can’t have a fritters lol Good luck to all!!! I drive my car right off of the ferry when I arrive, and into OB for the best Apple Fritter on the planet. Hat's off to you!